PESHAWAR: Qaumi Watan Party Chairman Aftab Ahmad Khan Sherpao has said that terrorism had played havoc with the lives of the people in Khyber Pakhtunkhwa and it is the time that the government should devised a clear strategy to effectively tackle the menace. 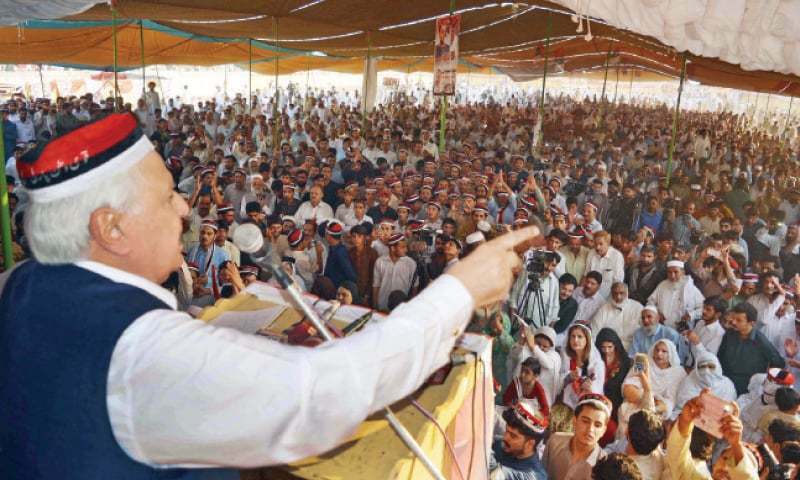 Addressing a public meeting in Kanewar in Tangi tehsil of the Charsadda district on Sunday, he condemned the suicide blast in Dera Ismail Khan which claimed life of former provincial minister and a candidate for KP Assembly Ikramullah Gandapur and injured five others. He expressed his deepest sorrows and condolences over the martyrdom of the politicians. Condemning the sorrowful incident, Sherpao said that with the martyrdom people had lost a good political figure in the province. He expressed his heartfelt sympathies with the families of the deceased and wounded people. He said that maintaining law and order situation and holding free and fair elections were the two key responsibilities of the caretaker governments. He lamented that they did not fully act upon their duties to eradicate the amount of serious incidents. “It is need of the hour that all the political parties and stakeholders should jointly work to take unified stand against terrorists in order to restore peace to ensure the safety of lives and properties of the people” he said. He has expressed his concern over the recent terrorism incidents and said that it was the time that the caretaker government should take effective steps to control terrorism and ensure protection of the politicians to provide them peaceful environment for smooth election campaigns and gave way to holding of transparent elections. He said that Pakhtuns had rendered numerous sacrifices in the war against terrorism both of lives and material but unfortunately no reward was paid to them for their sacrifices in the centre which further increased the sense of growing deprivation among them. He said that QWP would leave no stone unturned to address the grievances of the people. He said that Pakhtunkhwa needed an honest leadership for its welfare that could steer the province out of the existing problems. Sherpao expressed his grave concern over the unannounced and excessive load shedding in different parts. He said that in extreme hot weather electricity outrages made the lives of the people miserable. He expressed his firm conviction that the Qaumi Watan Party would fight for the rights of Pakhtuns and would raise voice against the exploitation of the people of his province on every platform. He said that his party would emerge the only representative of Pakhtuns in the general elections of 2018.